Buying A Condo For My Kids To Fund My Retirement? I was thinking about different scenarios that would make sense for me to become involved in real estate and one scenario came to mind. It’s likely that at some point (still very far down the road) my kids will move out either for college, for their first job, etc. One idea that I had was that such a moment would be a great opportunity to buy a condo? Why then? It would help them avoid renting it, would make it easy for me to “help them out” and would likely be located in an area where I could easily rent it back once they leave. Just feels like a win-win right? Once they do end up moving on, the condo would generate decent passive income which could be used to fund my retirement in a diversified way. I’m not expecting to wait 20 years to first start buying some real estate but I was thinking about this because it’s something that I’ll likely plan in advance. How? I’ll likely create a new bucket in the next few years and start putting money aside that will be used once that happens. Initially, it would be invested in higher risk assets and as the expected purchase gets closer, I would likely start moving into less volatile assets and cash. ETF’s are a perfect way to manage such a fund. I’d start in a few years, buy some equity funds and over time move to bonds and income focused ETF’s. It’s very easy to manage. Buying A Second Home Or Renting? -how much money is involved? -how much would I really end up using it? -how does that compare to renting one when needed? For now, we’ll continue to rent it out. We already own a condo abroad which “dictates” to some degree where we spend part of our vacations. It’s not a bad thing, far from it. We love being able to feel right at home over there. But I think it’s enough for us considering the amount of free time that we currently have. It just seems like the amount of money, time and work involved in buying and then maintaining it trumps the benefits. Yes, we could rent it out but that would likely be on a short term basis which would not work if we’re further away from it (kind of the point of owning a lakehouse right?). I’m guessing this could change later on in life but for now we’ll be renters! To some it’s obvious but others would argue for hours with me. Yes, dividends are great, yes I do think it’s possible to build a highly sustainable dividend portfolio that can generate passive income. That has certainly worked well for me with the USDP. I’d expect the performance to remain strong and the dividends to increase every year. It is fairly basic financial theory. When done right, diversification can give a higher expected return for the same amount of risk. That is why most portfolios include more than 2-3 names or several industries. When I look at many dividend portfolios, I often see high concentration of North American companies in a few different sectors. Yes, such a portfolio is somewhat diversified. But I don’t know why you would not want to add more. The benefit seems rather clear. Several asset classes or types of assets can be added fairly easily. How? ETF’s of course. By combining 5-6 ETF’s to your dividend portfolio, you’ll be able to add more dividend income but also greatly diversify the entire portfolio. What would I add? –International dividend stocks: It’s true that some foreign companies also trade in the US as ADR’s. But there are others that don’t. Big companies such as Nestle, Samsung and others choose to list on other exchanges. If you’re only trading US stocks, you are missing on many opportunities. Of course, the tax, conversion and legal issues in trading overseas make it more complex but there are several high quality international dividend ETF’s. –Bonds: While right now might not be the best time to buy some specific bonds, it’s hard to argue with the diversification benefits in adding some local and international bonds (government, corporate, high yield). It used to be difficult to find high quality names but there are now several high quality ETF’s that offer solid alternatives. You might probably argue that one reason for buying your own dividend portfolio is to avoid paying fees. I disagree as I wrote a few weeks ago but I also consider the diversification benefit to be much greater than any fee you’d end up paying. –Preferred Shares: Some other assets such as preferred shares are very difficult and costly to trade for individual investors but offer significant value. Buying an ETF means having a more structured and diversified way of getting exposure to asset classes such as prefs. –Gold or other metals: Not everyone will end up wanting to own physical assets such as gold or silver, especially if things such as inflation and financial collapses come back in the conversation. 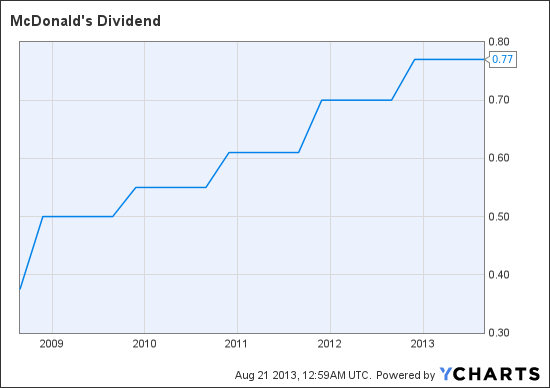 Do You Own Dividend Stocks? If so, do you think that is enough or do you complement your dividend portfolio with other assets? Rental Property – Going The AirBnB Route? Should I Look For Long Term Or Short Term Rentals? Traditionally, when you’d own a rental property, you’d try to find a tenant that will stay there for several years and pay a monthly rent. That has worked very well of course over the years. I would think that this strategy would work especially if the property is very well located since that is often what tourists end up looking for. One problem with this short term rental market is that there are a lot of properties that are unused and rented out this way for a short term period which keeps rates fairly low. I’m just not convinced that the extra work and hassle makes it worthwhile. I will continue to investigate though and would love to hear your thoughts. Have you or someone you know rented out property on a short term basis through Airbnb or others? Was it done as an investment? It was another good for my long & short trades with a few different things happening including the very nice rise in Microsoft (MSFT) on Friday when CEO Steve Ballmer announced he would resign within 12 months. Not sure how it feels when a stock jumps huge when you announce that you’re leaving but as someone with a long position, I was thrilled. Last week, I was a bit late updating my positions and ended up noticing that I was long Priceline (PCLN) in 2 separate trades. I’m closing out one of them today which is my most profitable live trade. Long Priceline (PCLN) & Short AOL (AOL) currently stands at +31,97% and will be closed on today’s opening. Not a big surprise for most of you I’m sure. I’m slightly worried about the stock’s very short term movements but overall, I continue to believe that the stock can go much higher over time and I’ve written a decent number of articles explaining why. Facebook dominates the social scene which will continue to mean big dollars for years to come. I do think RAX has a decent business and will be around for a long time but I can’t think of a reason that would justify RAX trading at a P/E over 40, which is about the same as Facebook. It faces fierce competition and margins will likely decrease over time so no, I don’t think it’s a value at this level. What if I told you that two of those 3 are the 2 best performing stocks in the S&P500 this year? In fact, it’s not even close. And no, of course, Blackberry, the stock that I’ve been bashing for months is one of the two. So who is at the top? One of them (NFLX) is much easier for me to understand than the other. Guess which one? Here are a few charts from their more recent earnings numbers…! 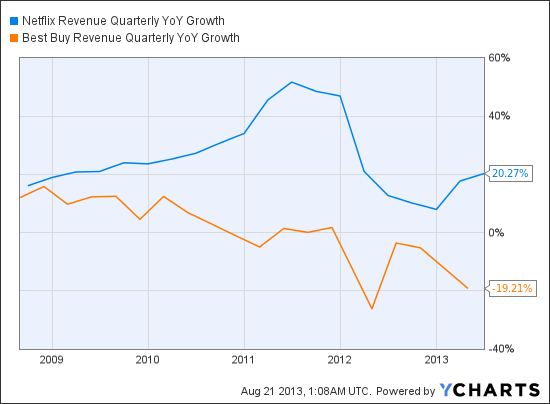 Is McDonald’s ($MCD) A Value Beyond $100? As many of you know, I’m seriously considering dumping my shares of Intel Corp (INTC) and while getting a similar tech stock would be ideal, there are not that many candidates so it’s much more likely that I’ll end up adding another type of company. Because of the existing companies that I hold, I’ll likely be staying away from energy companies and also try to go for ones that have international exposure. For that reason, I thought I’d take the time to look at McDonald’s (MCD), one of the more known companies in the world. MCD has been paying dividends for decades and as I wrote in a recent newsletter, it’s among the top 25 dividend stocks most held by fund managers around the world. No doubt, these numbers are very strong and much better than I expected. Not only has MCD been steady in increasing dividends but those have been growing fairly quickly. 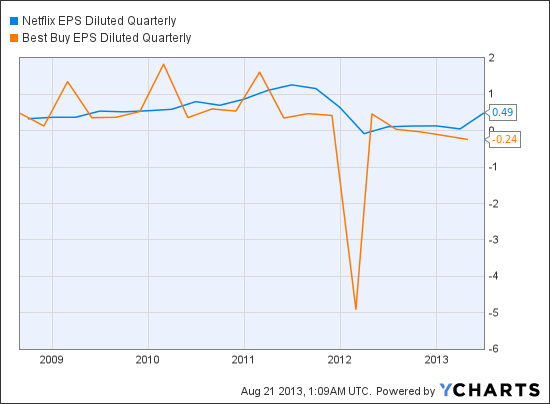 While growth in sales and earnings are smaller than I’d hope, they do remain very strong. I’m not sure a 7%+ dividend growth is sustainable long term but a 3-5% certainly seems possible. The P/E ratio is very slightly higher than I’d wish given the growth but MCD is so steady and diversified that it might be enough to offset those. While McDonald’s continues to face competition all around the world, it has such a strong and established brand that I don’t really see major threats. It serves a strong and growing market and has been able to position itself very well to face a consumer (in many of its bigger markets) that is looking for more healthy, higher quality food. There will continue to be threats and changes in the market but I certainly think McDonald’s will continue to adapt itself very well to such changes. Do I Really Need 100K Of Income At Retirement? Do I Really Need 100K? 3-There is a big difference depending on where you live. 100K of income in New York City, in South-East Asia or a small city in the middle of nowhere makes a huge difference. I could certainly imagine moving for such reasons but I currently live in a big city and like having the option to remain here. 4-I prefer to be extremely conservative here and will adjust if needed. How Would I Even Use 100K In Passive Income? –Housing & Property Taxes – (30-35K/year) unclear but I’d expect to see a significant decrease as I’ll no longer have a mortgage so property taxes and changes/house improvements will be my main expenses. Yes I might end up needing to go to a retirement house but that would mean selling my house which by itself will generate enough additional income. –Everyday expenses (20K) – If I include grocery, medications, other pharmacy expenses, I don’t think I should expect a significant change but this category would decline somewhat. Some things such as groceries and restaurants might increase slightly as my wife and I have more time to dine with friends but I’ll be spending less on clothes once I no longer require suits and nice clothes to go to work. –Travel (15-20K) – This is a big one obviously. I currently am lucky enough to do 2-3 longer trips (a week or more) per year as well as a few weekends in cottages). I do expect this category to increase in the earlier years when my wife and I are healthy enough to do bigger trips such as going to Asia, a safari, etc. We do understand that this is a luxury and might not be possible but if we’re going to try planning ahead for out retirement, why not try to have the possibility for such trips. –Taxes (25K) – Fortunately, taxes that I currently pay will diminish near retirement as the nature of my income changes. That being said, with governments struggling to avoid big deficits, rates might increase so I prefer being conservative. –Other Expenses (5-10K) – Many other expenses such as insurance, gifts to family and friends, helping out kids or giving to charitable foundations will also be part of our regular budgeting if we’re able to do so. Do you think it’s crazy for me to aim for such a level? Things remain fairly good for my tech & short stock picks. I have not done very well with my latest pick though and will be closing it out this morning. I had opened Long TripAdvisor (TRIP) and short Pandora (P) but TRIP had a very difficult week. It now stands at -23%. Why? It warned that the current quarter was going to come in worse than expected sending the stock down. That being said, things do remain good as my average trade this year has returned 1.84%. As always, you can see my live tech long & short trades here. 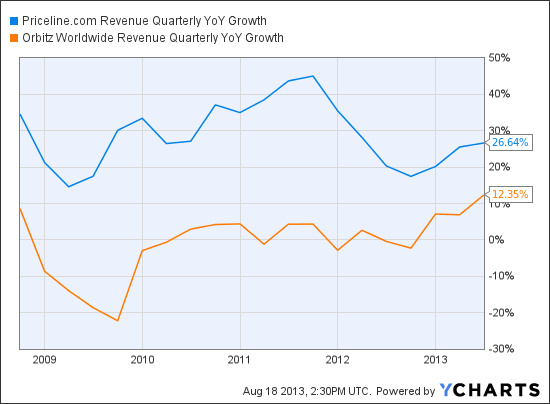 I’ve been a believer in Priceline for many years and long term shareholders have done extremely well. The company has a very steady user base and I personally think the acquisition of Kayak was a brilliant move to better compete with other players in the industry. Orbitz has had a good run and remains one of the top performing travel related stocks this year. The big problem though remains that Orbitz has been growing a lot more slowly in terms of revenues and profits so I don’t see anything that could possibly justify its current P/E ratio.